“End oppression, allow expression,” sang the protesters that gathered in front of the Complexe Guy-Favreau in downtown Montreal on Thursday, April 21. 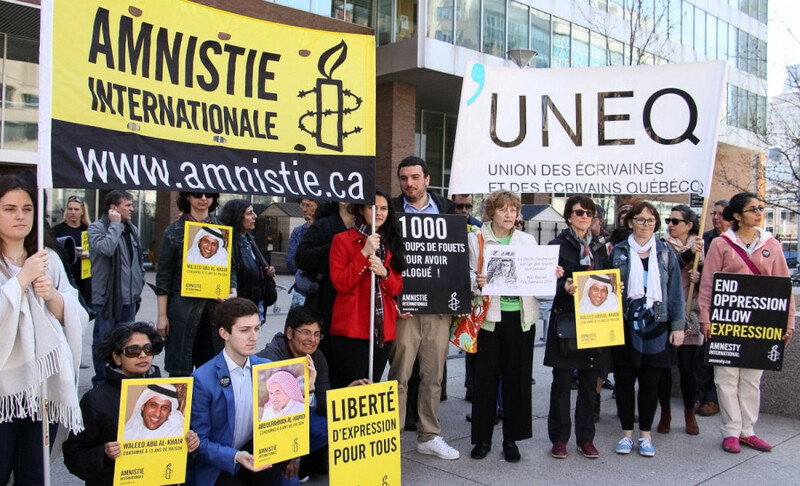 The chants were in support of imprisoned Saudi blogger Raif Badawi and his lawyer Waleed Abulkhair. 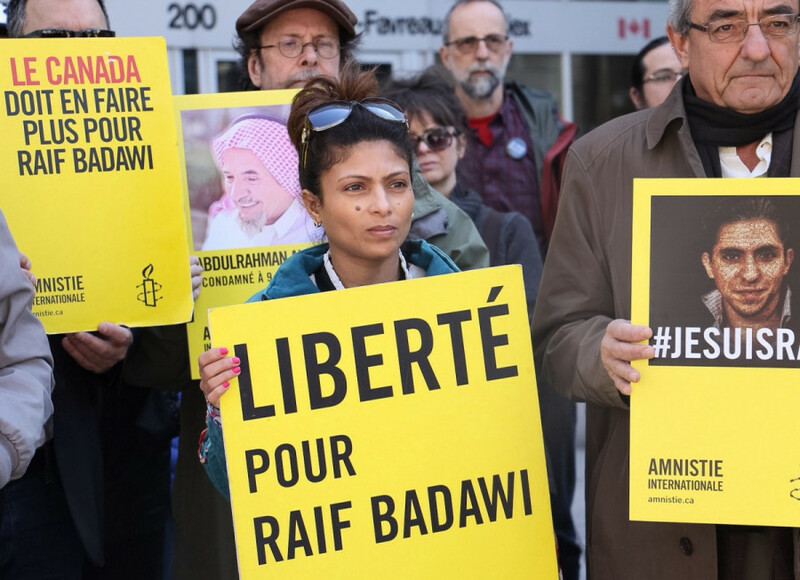 In June 2012, Badawi was arrested in Saudi Arabia on charges such as “insulting Islam through electronic channels” and “going beyond the realm of obedience.” He was sentenced to 10 years in prison and 1000 lashes. Members of Amnesty International and representatives of the Confédération des Syndicats Nationaux and the Union des écrivaines et écrivains du Québec were among those in attendance. Also present was Badawi’s wife, Ensaf Haidar. She has refugee status in Canada and has been living with her three kids in Sherbrooke. 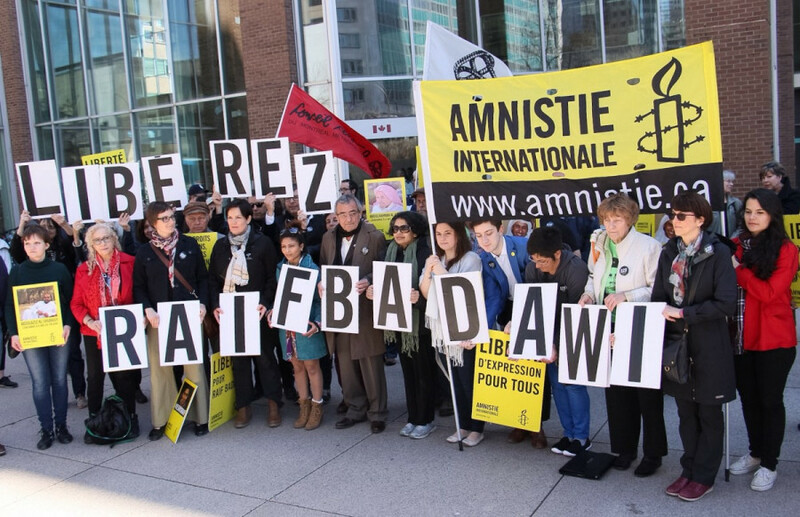 The demonstration was organized by the Canadian Francophone branch of Amnesty International, who are demanding Badawi’s release. 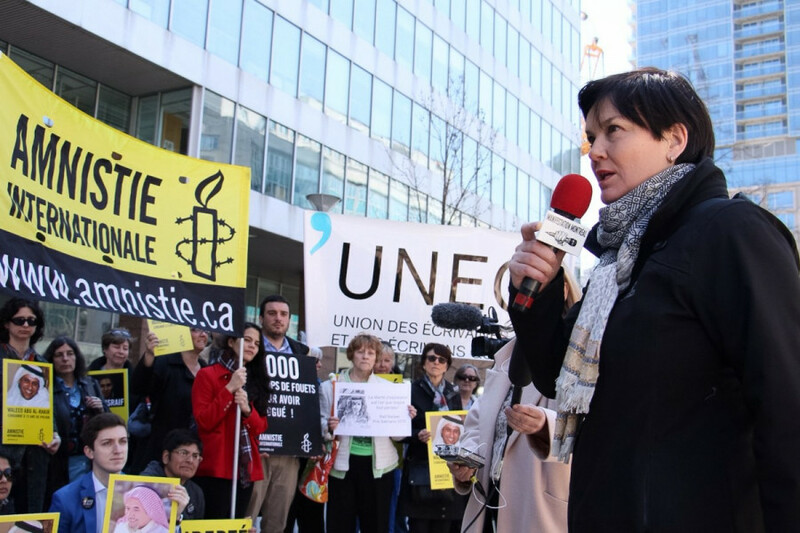 Speaking to the small crowd, Béatrice Vaugrante––Director General of Amnistie Internationale Canada Francophone––reminded that Amnesty has met with Canada’s Minister of Foreign Affairs, Stéphane Dion, but with little progress made. “We want to believe in when he says that he brings up the subject at meetings [with Saudis] but right now we see little impact,” said Vaugrante in an interview with The Link following the 30-minute demonstration. 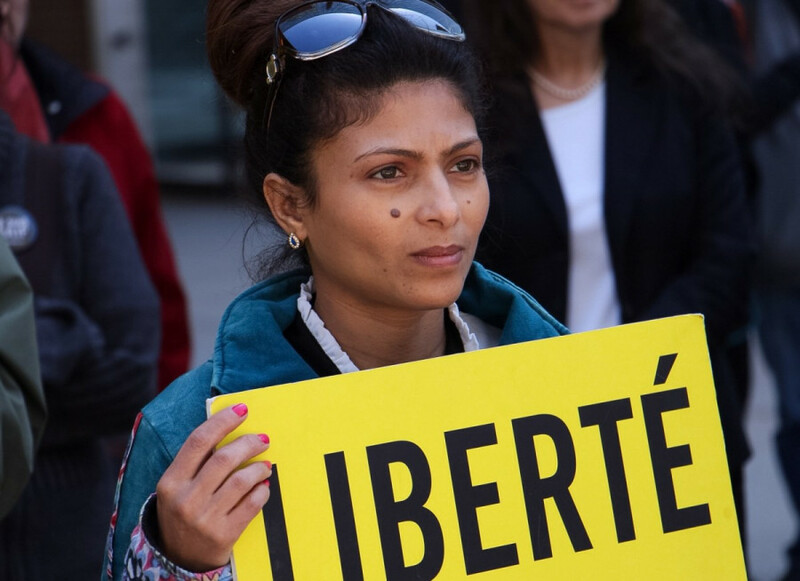 “Prime Minister Justin Trudeau certainly has influence and should exercise it to reassure Canadians and Quebecers that have followed Amnesty in its campaign,” she continued. In her address to the protesters, Vaugrante also reiterated her support for Haidar. “We’ve accompanied her so many times in trains, in administrative procedures,” said Vaugrante. Visibly humbled by Vaugrante’s words, Haidar thanked everyone for their support. “I have hope because you are there,” she remarked. 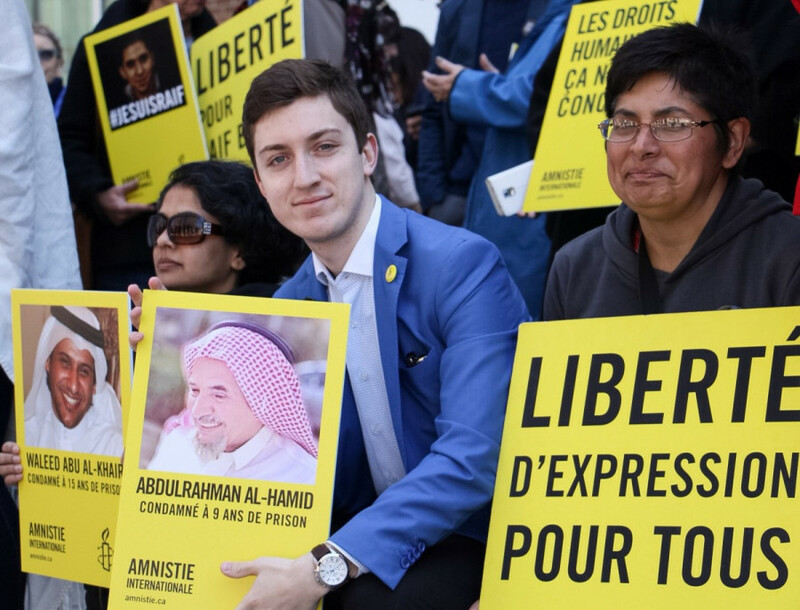 Vaugrante hopes people will sign the petition asking the Saudi authorities to cease the lashes and liberate Badawi, and write to their MPs. June 2016 will mark the fourth year of Badawi’s imprisonment. Vaugrante says there will certainly be more commemorative events moving forward.